Upper motor neurones make up one half of the body’s somatic nervous system – the other half being made of lower motor neurones. Both can be damaged in various ways and both have distinct clinical presentations. In this article, we will consider the definition, function and clinical significance of the upper motor neurones. An upper motor neuron (UMN) is a term used to describe what is damaged when a patient displays a variety of neurological signs. These signs are known collectively as a UMN syndrome. This distinction is useful as it aids the clinician in discerning where a lesion may be. However, the term does not have any neuroscientific or neuroanatomical basis. It is undoubtedly used purely because it is more convenient than describing which specific descending motor tracts have been damaged by a lesion. Despite this, the general definition of an UMN is a neuron whose cell body originates in the cerebral cortex or brainstem and terminates within the brainstem or spinal cord. Therefore neurons which give rise to the various descending motor tracts are all UMNs. In addition, neurons which input to the nuclei of the extrapyramidal tracts (such as the rubrospinal tract) are also UMNs. Within clinical practice, the term UMN is typically used to describe descending motor neurons within the corticospinal and corticobulbar tracts, which arise from the pre-central gyrus and terminate in the ventral horn of the spinal cord and motor nuclei of cranial nerves respectively. If there is an UMN there must be a lower motor neuron (LMN). You can find out more about LMNs here. In essence, a UMN will synapse with an LMN, which will synapse onto a muscle (for example). All UMNs exert their effects via LMNs, which may be one singular LMN or several LMNs. In reality, the system is more complicated, with several interneurones acting on both UMNs and LMNs, but the concept is the same. The neurotransmitter typically involved in the transmission from upper to lower motor neurones is glutamate. This section will focus on the UMNs in the context of the corticospinal and corticobulbar tracts. Both tracts originate within the pre-central gyrus, also known as M1. The pre-central gyrus is somatotopically organised. This means that particular areas of the body correspond to specific points of the cortex; there is a relationship between where a neuron originates and its function. This gives rise to the motor homunculus, where areas of the body with a larger precision of motor control (eg. the hands) have a larger cortical representation. Likewise, areas which do not have a great deal of motor precision have a smaller representation in the cortex. The function of the UMN can be thought of as similar to that of the corticospinal tract i.e. to facilitate voluntary movement. To be more specific, one cortical motor neuron is responsible for activating a group of muscles at different times in order to facilitate a certain movement. Further information on the descending tracts can be found here. Hypertonia – UMNs are believed to have a modulatory role in governing muscle tone through what is known as descending inhibition, althought this is not fully understood. It is thought that UMNs regulate inhibitory interneurons and their effect on alpha and gamma motor neurons. Loss of UMN input, and thus descending inhibition, means firing of alpha and gamma motor neurons is favoured, causing hypertonia. Furthermore, damage to cortical inputs to other descending tract nuclei, especially the medullary reticulospinal tract, known to inhibit spinal reflexes, may also be implicated. Hyperreflexia – Descending inhibition from the UMNs also regulates the extent to which the myotatic stretch reflex is elicited. Therefore, loss of the UMN causes brisk reflexes. Spasticity – This describes the phenomenon where a muscle is tight and stiff on passive movement in a velocity dependent manner. In spasticity, the amount of resistance is directly proportional to the speed of passive movement. For example, on rapid passive movement of a limb there will be a point where the muscle becomes suddenly resistant to further stretch. Furthermore, a ‘clasp knife reflex’ may also be present. This phenomenon describes how following a sudden increase in resistance there is a swift decrease in tone of a muscle, allowing the muscle to easily be stretched. 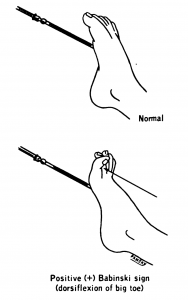 Positive Babinski sign – The Babinski test is a fundamental component of a neurological examination used to assess UMNs. The clinician will stroke a blunt object along the lateral border of the plantar surface of the foot. 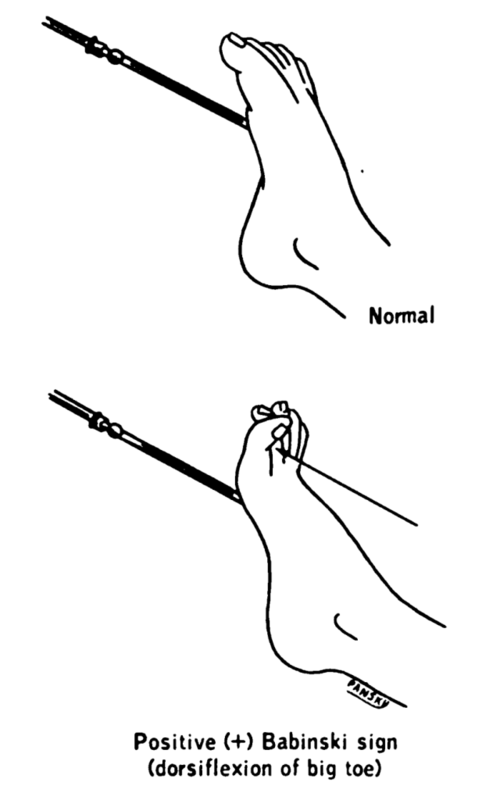 A normal response is flexion of the large toe and adduction of the other toes – this a negative Babinski sign. However, in patients who have an UMN syndrome an abnormal planar reflex is elicited whereby the large toe extends and there is abduction of the other toes – this is a positive Babinski sign. In infants below the age of two, a positive Babinski sign is normal. This is because the corticospinal tracts are not yet fully developed. Clonus – this is a series of contractions which occur in a muscle when it is suddenly stretched and held in that position. This is thought to arise due to an exaggerated stretch reflex. Long term disuse of a muscle due to paralysis may cause disuse atrophy. It is also important to note that although hypertonia and hyperreflexia are long term consequences of UMN damage, there is often an initial hypotonia and hyporeflexia immediately following damage. This is often seen in strokes of the cerebral cortex or within the internal capsule and occurs contralateral to the side of the lesion. 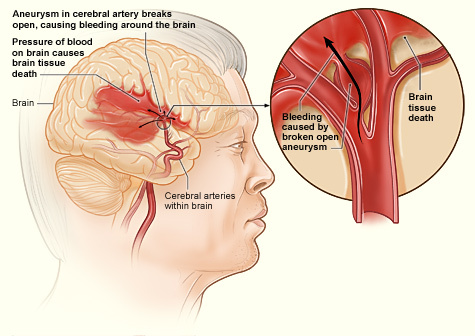 A stroke, or cerebrovascular event, is a clinical syndrome involving a sudden loss of brain function caused by disruption of the blood supply to the brain. A stroke and a transient ischaemic attack (TIA) differ in that the disturbances last 24 hours or less and resolve completely in a TIA. In a stroke the disturbances persist or result in death. You can read more about strokes here. Strokes are a common cause of UMN signs since ischaemia can affect the function of UMNs. The clinical signs caused by strokes typically relate to the affected vessel and its respective blood distribution. In particular, UMN signs are seen in total or partial anterior circulation strokes as these affect the motor cortex.. In addition, subcortical lacunar stokes of the internal capsule will result in UMN signs. 80% of patients who have a stroke have either hemiparesis or hemiplegia and 40% will go on to have long term impairment of function in the upper limb. Sensory deficits, such as numbness, dysphagia, dysarthria, homonymous hemianopia, and other symptoms may also be present depending on what cerebral vessels are effected. It is not uncommon for patients to regain some function in a previously plegic limb as the rubrospinal tract is able to compensate for the loss of corticospinal fibres to a certain extent.